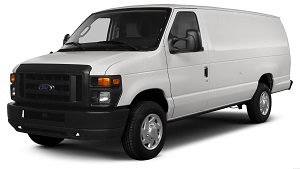 The Rumpo is a van in GTA 5. It resembles a Ford E-series with touches from the GM Van series. Strangely, despite being based on a Ford vehicle, it is built by Bravado when it should be more appropriately badged as a Vapid. The Rumpo in GTA 5 has average acceleration compared to other vans, but can be modified with a turbocharger in Los Santos Customs to bring it on par with the Ambulance. The Rumpo is somewhat agile and can corner easily at low speeds. Durability is average. One advantage the Rumpo has, being based on the Ford E-Series, is its high ground clearance, allowing it to cover rough ground with ease. The Rumpo features a 4.0 liter V6 engine powering the rear wheels. The 5.0 liter turbo diesel engine is still available as an option. The Rumpo is almost strictly a commercial fleet offering. While there are indentations for windows on the sides of the panel van, no ‘civilian’ version of the van has been produced. The Weazel News variant can be obtained at the end of Paparazzo – Reality Check. The Deludamol vans Trevor’s mother requests him to steal are Rumpos. These can be found parked outside hospitals or medical centers. Occasionally spawns in traffic or parked. Occasionally spawns outside the liquor store opposite the entrance to the Sheriff’s office in Paleto Bay. 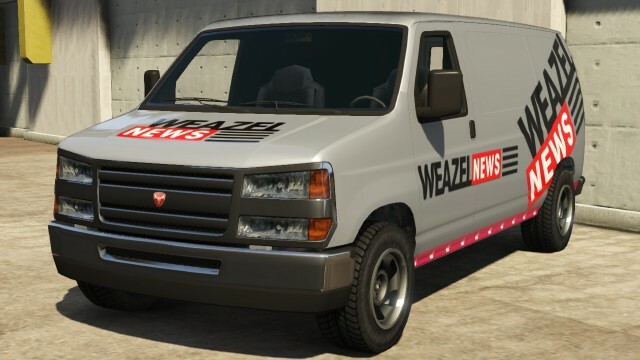 Spawns in random areas, Plain, and Weasel News livery. Sometimes spawns parked outside of the Grove Street Garage. The same applies for the Mule. Often spawns at the Docs and in city areas. 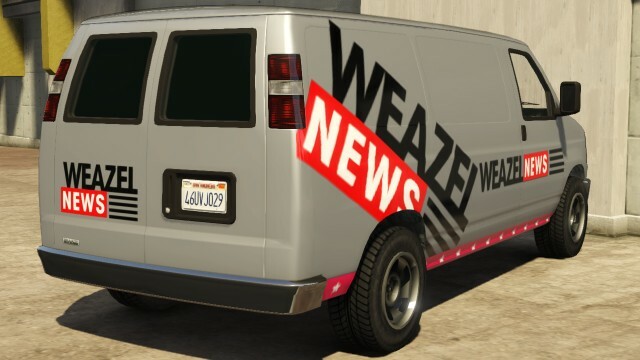 The Weazel News variant can be found parked in a driveway, next to a T-section located at South Mo Milton Drive, Vinewood Hills. At certain times of the day, it might spawn driving out of a factory/plant near the Vespucci Helipad. The same applies for the Pony and the Mule (although the Mule drives out opposite from the factory).